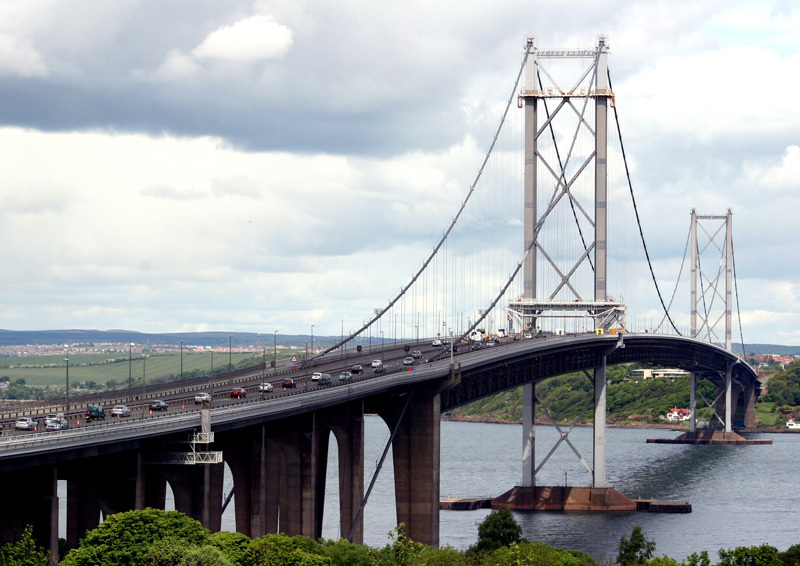 The existing Forth Road Bridge spans the Firth of Forth in Scotland. The main suspension bridge, with central span of 1006 m, has two multi-span approach viaducts leading up to the main crossing. The deck of the approach viaducts comprises a pair of longitudinal steel box girders supporting a series of transversely spanning steel girders, both acting compositely with a reinforced concrete deck. The steel girders of the approach viaducts are supported on steel roller and rocker bearings on concrete portal piers which vary in height between 11 m and 40 m.
An initial study of the bearings identified that the rollers had locked up due to corrosion and distortion, and the concrete beneath the bearings and elsewhere on the pier tops had deteriorated due to chloride contamination. Assessment showed that structural deficiencies in the pier were exacerbated by both the concrete deterioration and change in articulation. These factors led to the decision to replace all the bearings on the viaducts. Delegates can access the paper online prior the event.